What Is the Grill Masters Club? 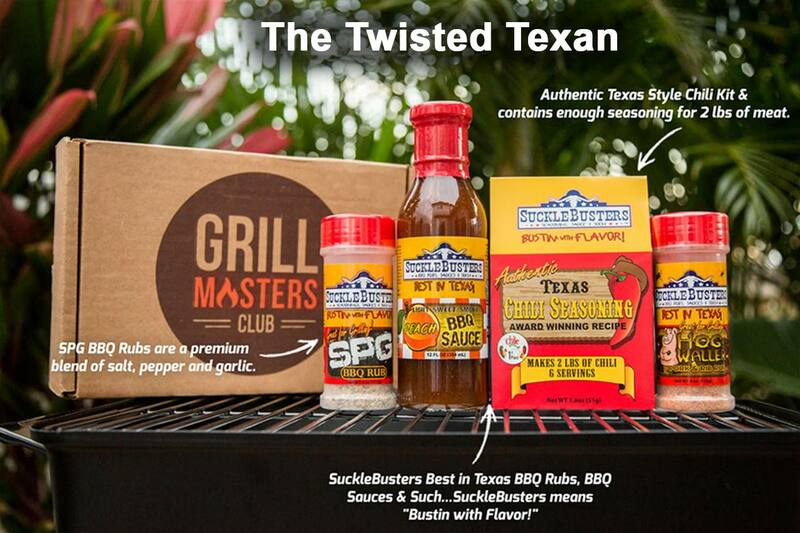 The Grill Masters Club is a “flavor of the month” monthly subscription box that is sent to members once a month containing niche and prize winning barbecue and grilling products. It’s the perfect way to sample a broad range of uniquely crafted products that you would have normally never had the opportunity to sample. For us, it’s a unique way to introduce our products to hundreds of new people. Here are a few past examples including our friends at Big Bob Gibson in Decatur, AL. This is literally a ton (2000 lbs) of BBQ sauce with a whole lot of spice on top. Several months ago we reached out to The Grill Masters Club to break the ice and get involved with them as a potential outlet for our products. They asked us to send some samples and wait for a response. We sent them our original Sauce Beautiful and original Rub Beautiful in their packaging and held our breath. After putting them to the back of our minds and focusing on other opportunities, we nearly forgot that we reached out to them. Then with the weight of the holiday season bearing over everyone, we got an email from The Grill Masters Club requesting 500 of each product. We prepared for the cook and got the ingredients ready to go for 500 units to complete the order, or so we thought. As soon as we were ready to finish bottling the last bottle of each product, The Grill Masters Club contacted us requesting 700 units total. During our initial run of 500, we reached out to John Auker of The Delta Cuisine in West Memphis, TN to schedule another cook for the following weekend. We scheduled the cook and prepared for an additional 200 units each. I jokingly replied to the email and suggested that they order 1,000 altogether! After a few days, we got another email needing 100 more units for a total of 800. At this point, 1,000 wasn’t a joke anymore. I suggested an additional 50 units be tacked on just in case there was an increase in sales for Christmas, and we agreed to 850. The weekend was scheduled and we continued to produce what was asked of us. We bottled, packaged, and wrapped 850 jars of sauce and 850 bottles of spice and put them on a palette to pick up so that they could be delivered to The Grill Masters Club warehouse in Greenville, SC. Literally as soon as the palette was picked up by our delivery contractor, another email came in requesting 100 more units! It was pure madness and we loved it! Luckily we bet on the strategy to produce 1,000 units and the product was ready to go. The only drawback was that we ran completely out of labels for sauce! We usually purchase labels in bulk but this was a single 1,000 unit hit and the better part of the roll of labels we had left! In fact, we had to get a short run two days before Christmas of 100 labels. Thankfully Art Advertising in Jonesboro, AR was able to grant our Christmas wish and the scramble to label the last 100 jars of sauce was in the bag. We have a slightly updated new label design for 2018. It was rushed into production because we ran out of labels! Clown Car To The Rescue! So the old saying goes, “That ship has sailed,” and so it had and was on its way to South Carolina, albeit 100 units shy of 950. Luckily for us, our trusty clown car was fresh off of an oil change and looking for a new purpose in life. Jeff and Patrick loaded up the clown car with the last 100 jars and bottles and took a trip across Northeast Mississippi to see family and then on to South Carolina to deliver the final payload. We’re thankful for their last minute Hail Mary pass completion and determination to succeed in fulfilling the seemingly never ending demand set forth by The Grill Masters Club. Thank you to Aaron, Steven, Tom, Brandon, Gil, Wesley, and Kayla for your contributions in making this order happen. Be sure to put your order in before January 4th for a chance to become a member of the Grill Masters Club January 2018 Box. There are no obligations and you can cancel at any time. Our box will ship out on January 7th. After Jan 4th, subscriptions will start in the February shipment.